Not many athletes these days have the commitment to their passion, dreams, goals, sacrifices and above all know what it takes in one’s journey to the top. 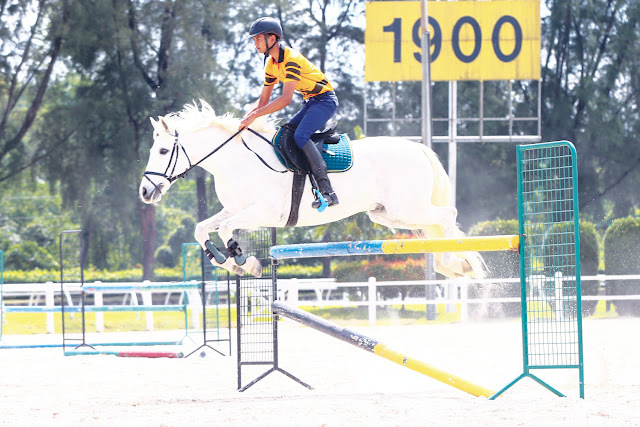 Equestrian Praveen Mathavan Nair, is one athlete who has has set his sights on becoming the first Malaysian equestrian Olympian at the 2020 Tokyo Games. However, the 20-year-old, despite showing total commitment and already having started his journey to achieve his dream, he has not received the kind of support this 'so called' sporting nation is expected to offer. As usual Praveen at a young age has been frustrated by sports politics, bureaucracy, unsupportive officials and an association who seem to have their own agenda. His latest frustration is that he has not been recommended by the Equestrian Association of Malaysia (EAM) for selection to the Olympic Council of Malaysia (OCM), for the Jakarta/Palembang Asian Games in August. At the last Asian Games in Incheon three years ago, he entered the qualifying rounds and qualified, only to be told he was ineligible because he was underage — as the competition rules required competitors to be at least 18-years-old. “I was disappointed. 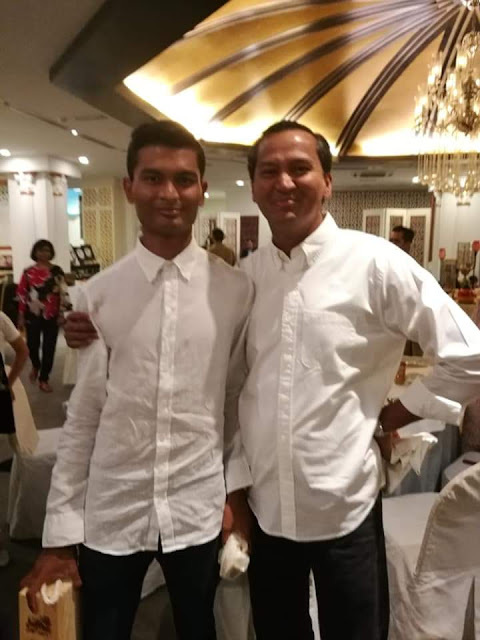 I had hoped to make my Asiad debut in Jakarta this year, but there is obstacles again,” said Praveen who was back in town for a few days to surprise his father for his 5oth birthday last weekend. 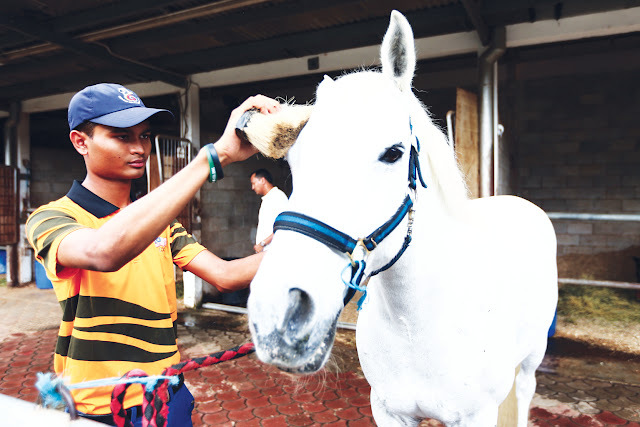 Praveen was the youngest Malaysian SEA Games gold medallist in the dressage event at the 2013 Games in Myanmar when he was only 15. Despite showing early talent, he was never really nurtured by the sports association, but thanks to his father Mathavan, who is better known as Matt, Praveen has been able to enjoy and hone his equestrian skills. Yes, Praveen is a lucky lad but his father instilled him the values of sacrifice, humbleness and working hard as his father had to undergo hardship and work hard. Praveen’s father graduated in biochemistry and went on to set up a company, Digital Autopsy, that is registered in England and which has made inroads in Malaysia too. Matts’ parents were rubber tappers in Ulu Tiram (Johor) estate. 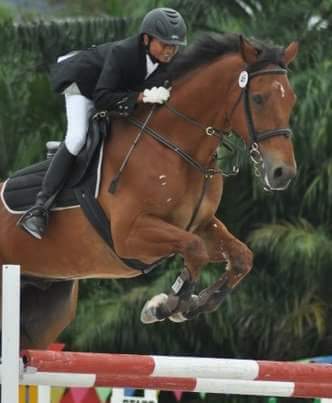 Obstacles are nothing new to Praveen, for last year’s Sea Games in Kuala Lumpur, he was not even recommended by the Equestrian Association of Malaysia (EAM). After winning gold in his debut SEA Games, he had to skip the 2015 Singapore Games because his horse was injured. Thus he wanted so much to compete last year, even more so since it was at home. Only the intervention of the Olympic Council of Malaysia (OCM), who had received an appeal from Praveen to be considered for the KL Games, that EAM decided to include him and he went to assist to win the team gold. Praveen had also qualified for the 2014 Youth Olympic Games in Nanjing. Praveen who was pursuing a degree in Economics and Business at Maastricht University in Holland, had moved to the Mecca of equestrian sport which is Limburg (in the province of Aachen, Holland) last year to pursue his goal of combining excellence in sport with academic distinction. Currently he has moved to England to train under John Whitaker, a Legendary British Equestrian Athlete. Besides training, he competes in professional circuit among the top tier international riders in Europe. Yesterday he was competing in the prestigious Equerry Bolesworth International Horse Show (13-17 June) and will follow up to compete in the The Al Shira’aa Hickstead Derby Meeting (21-24 June). “All I am asking to be given a fair chance to realise my dream. I have sent in my proposals to EAM and even to the Podium Programme, but have not got any feedback,” said a disappointed Praveen. “We are even prepared to pay one for one for the total cost towards my run-up to the Olympics. “I am the only Malaysian training fulltime overseas and I am bent on doing well to make Malaysia proud. “I know the cost is high for this sport, but assistance to get sponsors will be an option. “But nothing is forthcoming from the governors of the sports. “I seriously hope that my plight is given some thought as I am serious and strongly believe that I have in me what it takes to excel and do well. 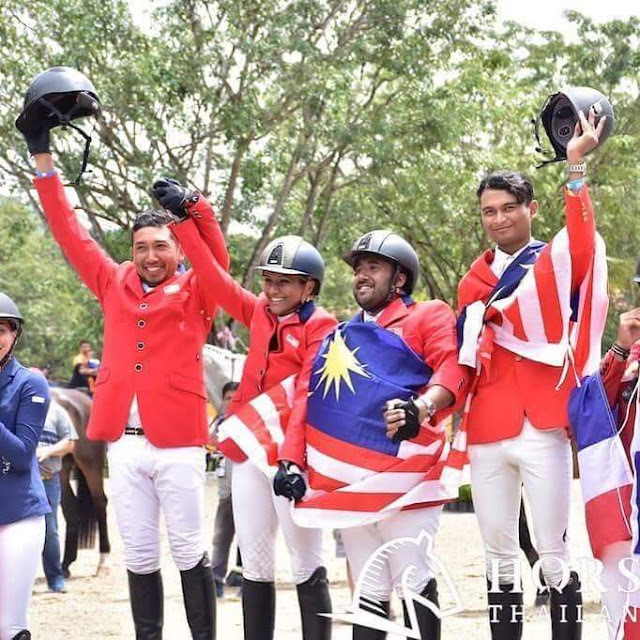 "I believe that I have a real chance in getting a medal in the Asian Games and being the first Malaysian to qualify for equestrian in the Olympics (I am already the only Malaysian to qualify and compete in the Youth Olympics). · Constantly competing in high level national and international competitions. Therefore, I know the circuit well and don’t have to go out of the way to do these qualifications. · Based with 3-time Olympic Medallist and showjumping legend John Whitaker. John is also 5 time World Championship Medallist and 13 time European Championship Medallist and is probably the most respected showjumper of all time. · Equestrian sport is highly about the management and planning leading up to our goals and I am at an advantage as John’s team and support will be crucial for qualifying for such world renowned events. From vets, to chiropractors, farriers, grooms, transport and admin – being based with John allows me access to the best possible team. · I am also competing in major competitions that most other riders will not be invited to which gives me more experience in high level competitions." However, Praveen said he will continue to chase his dream to qualify for the 2020 Olympics and intend to compete in the qualifiers starting next year. “I sincerely hope EAM will support me and can get assistance," pleaded Praveen. Will Praveen get to realise his dream or will be another disillusioned athlete whose talent was not nurtured! Alongside with this proposal, I have also sent a supplementing cover letter and another letter for me to be nominated for the podium programme as based on our understanding, I have far surpassed the criteria required in order to be part of the podium programme. u Representing Malaysia since the age of 13. Current age 20 years. u Competed in junior and young rider classes and also in the open senior international categories with numerous results. I have been always been extremely committed to his passion and have achieved great results through his journey to the top. I am determined to keep rising to the top and requesting for the support and funding. I am requesting a 3 step funding as below in order to achieve the milestones stated and do a run up to the 2018 Asian Games and the 2020 Olympic Games. u John Whitaker, a Legendary British Equestrian Athlete. u Multiple Olympian, World and European Champion. u Mentoring and guiding Praveen to train and compete among the worlds best.